Hot spring retreats can border on the humdrum – you've seen one, you've seen them all. Or so I thought. Then I heard about Colombia’s Santa Rosa de Cabal, which is not only blessed with natural therapeutic thermal springs (one of which is actually fed by a piping-hot waterfall! ), but surrounded by impossibly lush landscapes of rolling hills, fertile pastureland, and soaring mountain peaks, all set in Colombia’s picturesque "Coffee Triangle." After 10 months of trotting the globe, soaking my weary bones in warm waters, in wondrous natural surroundings, sounded like just the ticket for some much needed R & R.
A duo of hot spring retreats here beckon visitors with an atmosphere all their own. At the Termales Santa Rosa de Cabal Hotel, visitors can soak underneath cascading hot waters as they pour from a mountainside. Once things heat up, cool down at the other end of the springs, where a bigger, cold waterfall offers an instant cool-down session; a couple of thermal pools at different temperatures link the two chutes. Changing rooms, a bar and cafeteria, spa, and bathrooms are available to visitors; but skip the over-priced on-site hotel. We came in the evening (the pools stay open until close to midnight) and were rewarded with fewer crowds and cooler temps for a more refreshing dip – plus, streaming salsa music for some only-in-Latin America flair ($22/adults, $11/kids). Nearby, a small hike alongside the lush banks of a babbling brook leads to the Termales Santa Rose de Cabal Balneario, overseen by one of the loveliest waterfalls you’re likely to come across the world over (pictured above). Here, the scenery of cloud forest greenery makes the trip worth it in and of itself, though, of course, the numerous thermal pools, spa, and bar/cafeteria are a nice added touch. (Tip: Avoid going on weekends or school holidays, when the peace is interrupted as the pools are overrun with rambunctious kids and their seemingly oblivious – and possibly drunk – parents; $17/adults, $8.50/kids). Keep in mind that this destination is refreshingly "gringo"-free, and caters largely to a domestic, Spanish-speaking audience – the international guidebooks have yet to find their way to this hidden Colombian Eden (in all fairness, a decade ago, this place was still rife with guerrilla activity, which has long since disappeared). Basic Spanish or at least a Spanish phrasebook will work wonders in ensuring you make your way around with relative ease. The one exception was the great-value Matisses Hotel Campestre (pictured to right), with its refreshingly efficient English-speaking hosts, a charming husband-and-wife team from the area, who spent time living in the States. Opened just over three years ago, the hotel is set on perfectly manicured grounds (formerly farmland), with a pond, kids’ play area (with trampoline), pool, Jacuzzi, and bar/breakfast room, all with sweeping views over the surrounding mountains. The best part is that it's set just 10 minutes from the thermal springs. Oh yeah, and two adorable dogs make for great companions while there. A dozen rooms offer comfortable beds, reliably hot showers, and private balconies or patios. 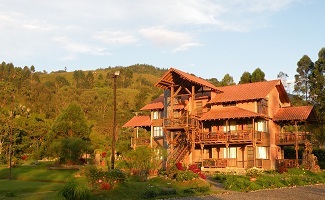 Rates start from $82/night, including breakfast and a 10 percent discount on admission to the thermal springs. Access to Santa Rosa de Cabal is via Cali (a 3-hour drive), Medellin (a 5-hour drive), or, via the airport in Pereira (the Matecaña Airport is 30 minutes away), which receives regular, inexpensive flights from Bogotá (we found flights from around $160 round-trip). Have you ever been to Santa Rosa de Cabal? Tell us about it!